Born in Belgium in 1939 to Jewish parents who had been forced to flee their beloved home in Berlin six months earlier, Sylvia Ruth Gutmann spent the first three years of her life in hiding with her family in the south of France. In the summer of 1942, three-year-old Sylvia, her two older sisters, and her young mother were arrested by the Vichy police and shipped to the French internment camp in Rivesaltes. Shortly thereafter, her mother was deported to Auschwitz, leaving her three children behind. Six months later, Sylvia's bedridden father was also deported to Auschwitz. Sylvia and her sisters would never see their parents again. Deeply traumatized, Sylvia arrived in New York City at age seven, where a well-meaning uncle and a cruel aunt took her in. Don't speak of it. Put it behind you. Move on, they told her. The messages she received in America forced her to again keep silent and hide in full view. She spent the next five decades struggling to put the pieces of her life back together and to fully understand the past she was too young to remember. A Life Rebuilt: The Remarkable Transformation of a War Orphan chronicles an odyssey that spans sixty years, three countries, and thousands of miles. Remarkably, at age sixty-two, Sylvia developed a relationship with a young man, forty years her junior, and against all odds she moved to Germany to live with him. Here she began to share the story of her family's fate with German students, senior citizens, and even neo-Nazi groups. By doing so, Sylvia reconciled with the people she had feared and loathed, and resurrected the lives of the parents she cannot remember, and cannot forget. 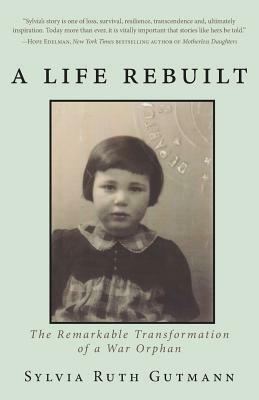 Heartbreaking and ultimately inspiring, this memoir of loss, love, resilience, belonging, identity, and authenticity has a surprising resolution, told in an intimate voice with candor, substance, and heart.